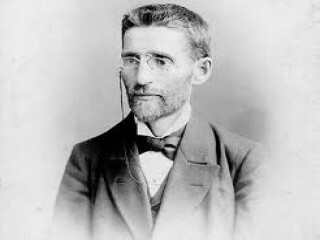 The Hebrew lexicographer and editor Eliezer Ben-Yehuda is known as the father of spoken Hebrew. He revived the Hebrew language and forged it into a modern and viable instrument of communication. Eliezer Ben-Yehuda was born in the small town of Lushki in the province of Vilna, Lithuania, where he received a traditional Jewish education. At an early age he moved from town to town in search of good religious and secular schooling. He completed his secondary education in Dvinsk. Realizing that he would not be accepted in a Russian university because of discriminatory laws against Jews, Ben Yehuda went to the University of Paris, where he studied medicine in 1879. The struggle for independence in the Balkan countries made Ben Yehuda aware of the homelessness of the Jews and of the need to restore the ancient, wandering people to its homeland—Palestine. In 1879 Ben Yehuda published his first Hebrew article in Hashahar (The Dawn), the foremost Hebrew monthly of the time. He presented the then novel idea of the return to Zion and revival of the ancient Hebrew tongue as the spoken language of a resurrected people. During his stay in Paris, Ben Yehuda succumbed to tuberculosis and had to postpone his plan to settle in Palestine. He went first to Algiers, where he continued to publish articles in the Hebrew press, including the weekly Havazelet, printed in Jerusalem. In 1881 he was invited to Jerusalem as assistant editor of that weekly. His health having improved, he accepted the post. On his way he married Dvora Jonas, who shared his ideals. Upon his arrival in Jerusalem he organized a group which dedicated itself to the task of using Hebrew as a daily language. It took Ben Yehuda many years of persistent work to convince the skeptics that Hebrew could be made to live again. He was also bitterly attacked by religious factions in Jerusalem, who opposed the secular use of the holy tongue. In his own newspapers, which he had begun to publish, he coined new Hebrew terms and words for daily use. His children were the first in modern times to speak Hebrew as their mother tongue. To make available the riches of ancient as well as modern Hebrew, Ben Yehuda concentrated his efforts on his monumental lifework, The Dictionary of the Hebrew Language, Old and New. He worked daily on the dictionary and continued the task during the years of World War I, which he spent in New York. At his death five volumes of the dictionary had been published. Ben Yehuda left enough material to complete the work. In all, 16 volumes were published, the last one appearing in 1959. Ben Yehuda also wrote textbooks in history and literature and translated literary works into Hebrew. Ben Yehuda's first wife, Dvora, died in 1891. His second wife, Heinda, a sister of Dvora, was the first woman to write stories on life in the new Palestine. Ben Yehuda suffered from poor health; at times he endured hunger and persecution; yet at the end he witnessed the triumph of his ideal. The Hebrew language, which has become the national tongue of Israel, today serves as the mortar that cements the multilingual Jews who have come from the far corners of the world into one nation. View the full website biography of Eliezer Ben-Yehuda.